Swimming pools can attract all sorts of wildlife if you're not careful. The constant moisture can foster mold and algae if the water is not properly chlorinated, and insects along with other creatures may find their way into the pool water. This is especially true if there are a lot of trees or grasses nearby. Frogs can be another problem, as they will jump into the pool and then not be able to get out. Keeping frogs out of a swimming pool can be accomplished with a little preparation. Frogs can easily find their way into a swimming pool that is free of obstructions. Install a fence around the pool. The barrier will prevent frogs from jumping or falling into the water. A solid fence is better than chain link for that purpose since small frogs would still be able to fit in the gaps of a chain-link fence. Use a cover whenever the pool is not in use. This prevents frogs from falling into the water and you can easily remove any that you find on the cover itself prior to uncovering and preparing the pool for swimming. Remove items such as woodpiles, shrubs, ferns and potted plants from your pool area to reduce the habitats that frogs are attracted to. Turn off your pool lights at night. Lights draw many types of bugs and, as a result, attract the frogs that rely on insects as a food source. Use an insecticide to kill off insect populations near the house and pool. By reducing the frogs' food source, you can force a relocation and reduce the number of frogs in the area. Spray the area around the pool with either salt water or vinegar. These solutions will cause a burning sensation in the frogs' feet and send them running in the opposite direction. 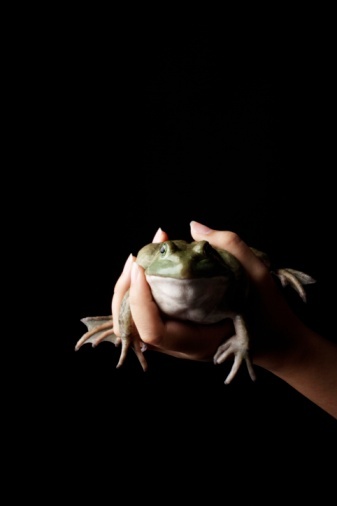 Apply a frog repellent to the area around your home and pool when all else fails. The repellents are usually toxic and can kill frogs and other creatures that come into contact with them. Do Mothballs Repel Toads and Frogs?